We recently added “Jersey Shore Jen” to our links, please check out her work. Jen A. Miller is a freelance writer. Her work has appeared in The New York Times, The Philadelphia Inquirer, Men’s Health, Men’s Fitness, Allure, Woman’s Day, New Jersey Monthly and USAirways Magazine, among others. 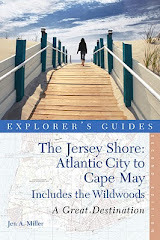 She’s also the author of The Jersey Shore, Atlantic City to Cape May: Great Destinations: A Complete Guide.